My wife, Vals, a friend, Bosa Raditsa, and I went to Sicily in February 2015 for a three-week holiday. Vals and I first flew to Naples, where we had an utterly splendid time visiting its great museums and dining exceedingly well before taking the ferry to Palermo, where we met Bosa, who had come from Genoa by ferry with her car. We spent a few days in Palermo visiting extraordinary sites such as its gold-mosaic- encrusted Norman churches before finally departing to drive around the island to see as much as we could in the time that we had left. Our very first stop after leaving the city was the vineyard and winery Bosco Falconeria en route to the medieval hilltop town of Erice. Prior to our departure for Sicily Vals and I had read several books about the island and one of our favorites was On Persephone’s Island: A Sicilian Journal, by Mary Taylor Simeti. Mary Taylor had just graduated from college in 1962 and had decided to spend a year in Sicily before returning to the States to go to graduate school. Manhattan-born, she had gone to Radcliffe, where she majored in medieval history, but was unsure of what to do once she had earned her degree. Instead, after working as an intern for nearly year while there, she fell in love with and married Antonio Simeti, a professor of agronomics in Palermo. 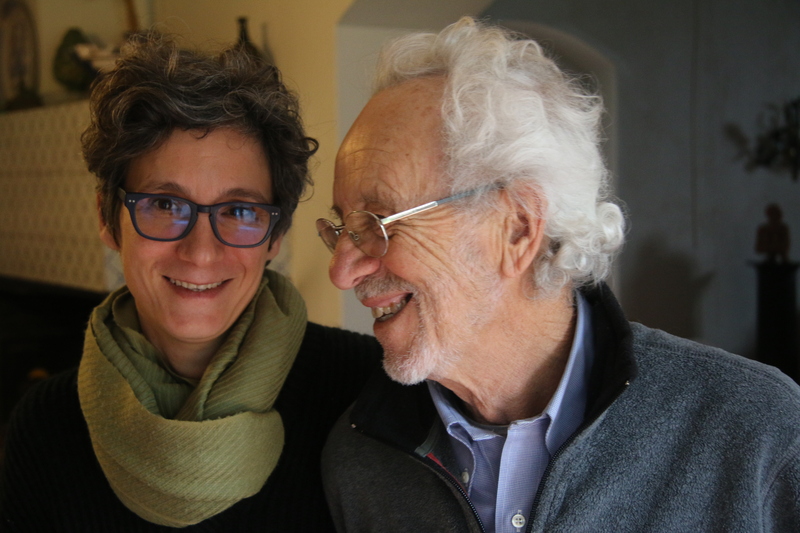 She has lived in Sicily ever since, raising two children, Natalia and Francesco, writing several books on food, history, and Sicily, and helping run a farm and vineyard. By the late 1980s Mary’s On Persephone’s Island (1986) was enjoying good reviews and a receptive readership in the United States. It was on her visits back to New York to visit family and promote her book that she learned about organic agriculture and brought information about it back to the farm. It was decided that organic viniculture would be the path that they would pursue in their quest to make quality wine at a reasonable price. By 1989 the entire farm had been fully converted to organic growing and three years later it became officially certified. It was registered as Bosco Falconeria azienda biologica Simeti-Taylor, and was one of the earliest adopters of organic agriculture in all of Sicily. Even before the trip I had read online that the farm, Bosco Falconeria, was a producer of organic grapes for wine, a special interest of mine, so I decided to visit them as it was only 60 km. from Palermo, in Partinico, en route to the west coast of the island. I also learned that Bosco Falconeria has also been seeking wider distribution of their wines in the United States. In that case, there was all the more reason to taste the wines and write about them. So I wrote to Mary Taylor Simeti, who responded very graciously to say that we were welcome to come though she would be in the States when we arrived. Besides, she now has little to do with the care of the vineyard or the making of the wine at a nearby azienda. It is her daughter Natalia who, with her husband, now runs the farm and attends to the wine. So, in mid-February we set out for the farm, having punched the address into our Garmin GPS. Alas, the GPS took us very close to the farm, but on the wrong road. GPSs have a flair for doing that from time to time, especially in rural areas that are not well mapped. ( Had we had the farm’s coordinates we’d doubtless have done much better.) We eventually arrived there, an hour late, to our dismay and Natalia’s, for it was terribly close to their lunchtime. Nevertheless, she and her father, called Tonino by his family and friends, gave generously of their time for the interview and the tasting. Indeed, they were very charming and the conversation was most informative. The farm has been in the Simeti family’s hands since 1933. At that time it was a 25-acre farm mostly dedicated to vineyards and the winery was in the barn. It came into Tonino’s possession in 1966 after his older brother died suddenly. Tonino and Mary then converted the farmhouse into a vacation home, living most of the year in Palermo while spending holidays and weekends there. The devastating Benice earthquake of 1968 in western Sicily, with its epicenter not far from the location of the farm, did considerable damage to the property and required extensive repairs and reconstruction. At one time there were several palmenti, or stone crushpads where traditionally the grapes were stomped by barefoot workers, the juice running into tubs that were then poured into vats in the barn, where the winery was situated. However, all but one palmento is left, partly because of the difficulty of removing it and partly, perhaps, because it is a chunk of nostalgia good for conversation. It’s in the farmhouse, covered by a desk. The farm is located in the province of Palermo, near Partinico, in the region of the D.O.C. of Alcamo, which was best known for its white wines when it was created in 1972, but now has a much more diverse range of varieties, including Grillo, Catarratto, Inzolia, Grecanino and the non-native Sauvignon Blanc and Chardonnay among the whites. Nero d’Avola, as well as the non-native Cabernet Sauvignon, Merlot, and Syrah are among the reds permitted in the zone. However, it should be pointed out that Bosco’s wines do not bear the Alcamo imprimatur of origin but rather the more general I.G.P. Terre Siciliani, which allows for a much wider range of varieties and styles than that of the D.O.C. It’s a small azienda of 17 hectares (42 acres) and 7 hectares (about 17 acres) are planted to vines. Tonino and Mary’s son Francesco eventually moved to the United States and lives in Brooklyn as a successful artist. Natalia went to university in Rome, where she earned a degree in Art History. Eventually that took her to the United States, where she worked as a museum administrator. However, Natalia returned to Sicily in 2005 and took a museological job in Palermo. She then met the man who would become her husband, Ramo Sali, from Finland, and now they two have children. After a while, as she was not that happy in her new job, and given that they spent every weekend at the farm, the lifelong connection to it proved to be too strong to resist. After three years passed she and Ramo took over running the farm and vineyard. Well before that the winery on the property had been closed down and the grapes were being sent to a small, local winery, Azienda Cossentino, which also makes organic wine of its own. Natalia’s passion is not only the vineyard but the farm and its other products as well. There are olive groves and orchards with various species of fruit trees. The produce is sold in Palermo along with fresh and dried legumes as well. All are grown organically. The varietals that they make are two of Catarratto and one of Nero d’Avola. 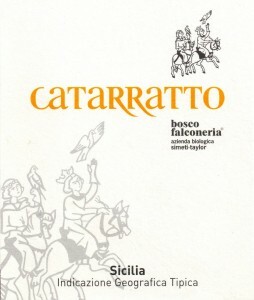 Catarratto is a white grape and it is the most widely planted variety in Sicily and the fourth in all of Italy. While it has been used for the production of sweet, fortified Masala, but it has moved up in the world to offers, at its best, a citrusy nose, nutty taste, or can even, resemble Viognier when fully ripe. The Nero d’Avola is a red-wine grape that is the most planted—at nearly 50,000 acres—on the island. Once used primarily as a tenturier in the making of wines on the mainland that needed more color, it too has found its place, producing varietal wines with black fruit aromas and high acidity. The best will age well. It is sometimes blended with Cabernet Franc, Syrah, or other such varieties, and in Cerasuolo da Vittoria, Sicily’s only DOCG, it is blended with Frappato to make a distinctive light red wine. The important thing is that the two varieties thrive in the black soils of this DOC. At Bosco, there are two subtypes or clones of the Catarratto grape planted: Comune and Extralucido. The comune is, as the name implies, the more common of the two, and when ripened, has the highest sugar content and lowest acidity, with dusky grape skins, whereas the extralucido has the lowest sugar and highest acidity, with a rather bright skin (i.e., little or no bloom on it). The latter is also the one that has the most aroma. (In between these two subtypes is a third, lucido, but it does not feature in Bosco’s wines.) Today plantings of Catarratto of all three subtypes dominate in the provinces of Palermo, Agrigento, and particularly Trapani, mostly at elevations of 250 m. (820 ft. or more) which is almost exactly the altitude of Bosco Falconeria, located as it is in the hills in the west of Palermo province. Bosco’s Catarratto come in two styles. One is designated as a varietal, with the name of the grape on the label. It is steel-fermented and the 2012 version has 13% alcohol. The second is called Falco Peregrino, which is fermented on the skins, using wild yeasts. Also steel-fermented, it has but 11% alcohol. It has more character, with a citrusy aroma and slightly tannic astringency derived from the skins, and a mildly bitter aftertaste that is typical of the variety. No sulphites are added to the second version. Both styles benefit from some age and should be served chilled. At present, only the rather austere Catarratto is available in the United States, the Falco Peregrino not yet, perhaps because it is less stable for travel given the lack of added sulphites. According to Natalia, Catarratto, as a varietal, “gets better with time.” We tasted both a 2012 and a 2013, and vintage differences aside, the 2012 had the advantage of an additional year which made the wine a bit more rounded and somewhat less austere, but she pointed out that a recently-tasted 2007 was very nicely developed, but we didn’t have that for our tasting. How long these Catarratto will age obviously depends on the vintage, but clearly some age is recommended for the wine to express itself fully and well. The vines are either pruned to a Guyot trellis or pruned in the Alberello alcamese manner, which is to say, in the form of a small tree kept low to the ground with a short cane carrying three or four buds tied to a spur on another branch, thus forming an arc. This kind of pruning is ideal in areas of strong and persistent winds, so that though the fruit may be splayed on the ground, it is kept dry and free of disease by the breezes. A great advantage of this kind of pruning is that all the fruit is close to the trunk and tends to ripen at the same time. The disadvantage of the Albarello form is that it cannot be harvested mechanically and the labor is backbreaking. However, when I pointed out to Natalia that harvesting Alberello-trained vines was so difficult, her response was to say that there’s a great deal of work that goes into installing a trellis system like the Guyot, it’s just that much of the work is at the beginning of the season rather than at harvest. Furthermore, she likes the fact that she doesn’t have to walk in a straight line to get to the end of a row and in fact can circle the vine and reach it and work on it easily. 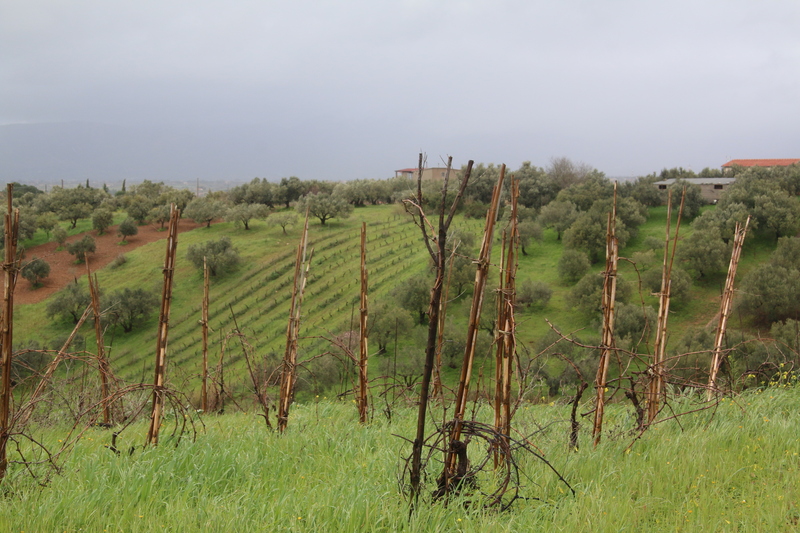 Indeed, it occurs to me that those advantages help explain why alberello has been in use since Roman times and until about the 1950s was almost the exclusive form of pruning in all of Sicily. 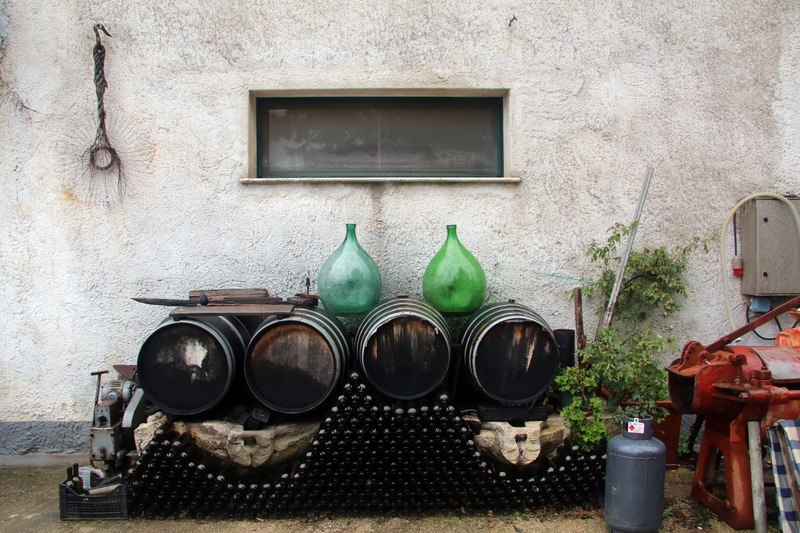 Once modern vinicultural practices began to make headway in Sicily its use began to diminish precipitously. Today only about eight percent of all vines on the island are so trained. 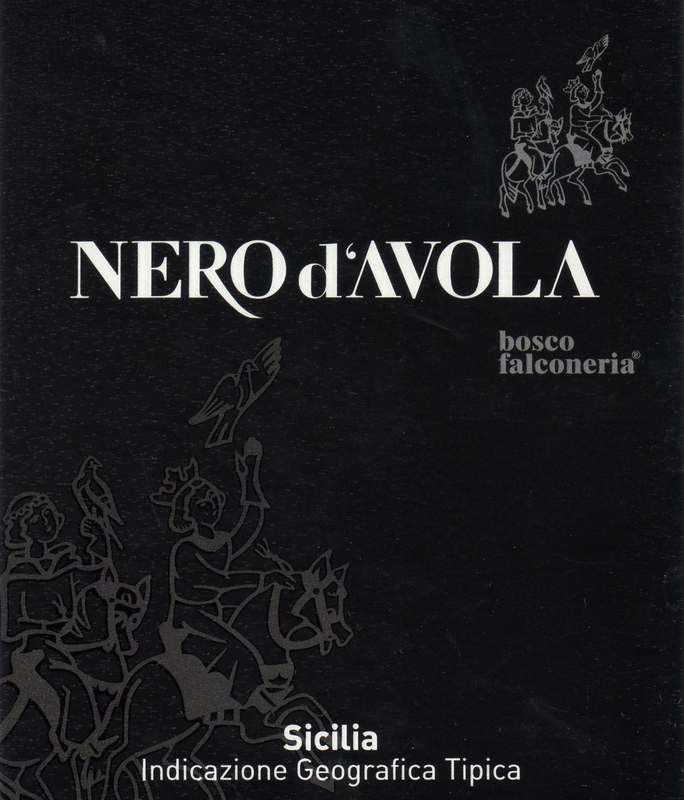 Nero d’Avola, Bosco’s other variety, is known for its tendency to grow radially rather than upright, which is what most vinifera varieties do. It therefore lends itself well to alberello training. Not long ago it was grown mostly in the southeastern part of the island, but it is more widely distributed now. It is an early ripener and its wine can be quite dark, with dark fruit notes on the nose, especially blackberry. It can be made with medium to high alcohol, depending on the site and so on, but it is typically high in acidity that in a well-made version will help balance the rather soft fruit. At Bosco the variety is fermented and stored in stainless steel, so it never has contact with wood, for the idea is to have a pure expression of the fruit. Thus the wine is fermented on the skins and aged in steel for nine months and then refined in the bottle for about four months. The 2012 that I tasted offered a medium body with just 12% alcohol, but black fruit was evident on both the nose and palate, and it had a strong acid backbone. All the wines are made to be sold at affordable price points and in that respect they offer decent value. The Catarratto that I purchased in New York City costs $20 a bottle. The total of all the wines produced is but 8,000 bottles, which is barely 660 cases. It is only in the last several years that the Simetis have become more aggressive in promoting and selling the wine in new markets in Italy and abroad. Before that the wine produced had been sold locally and in Palermo, but today some of it is imported to the United States by Jenny & François Selections, who specialize in natural wines. Bosco is also a B&B as well as a Tai Chi center, as Ramo is an instructor in that art of exercise. This entry was posted in Vineyards, Viticulture, Wine importers and tagged Antonio Simeti, Bosco Falconeria, Catarratto, Mary Taylor Simeti, Natalia Simeti, Nero d'Avola, Palermo, Ramo Sali, Sicilian Wine on 31 July 2015 by JoseM-L.
Great article, as always. Would love to visit.